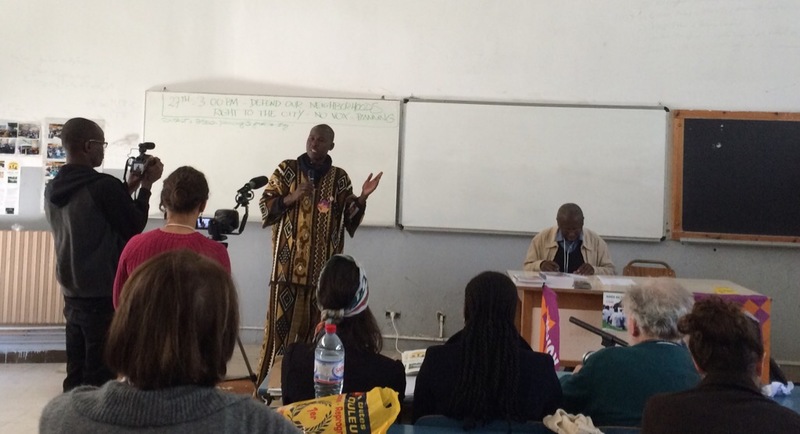 I myself was at the World Social Forum for having taken part in some research on civil society involvement in Habitat III, set to take place in Quito, Ecuador in 2016. This is the massive conference that takes place every twenty years to produce a “Habitat Agenda” designed to guide the actions of UN member states in dealing with rapid urbanization across the globe. So I attended events organized by Habitat International Coalition and other groups fighting for the rights to housing internationally, where there was discussion about how Habitat III can be used as an opportunity to further mobilize towards these rights. 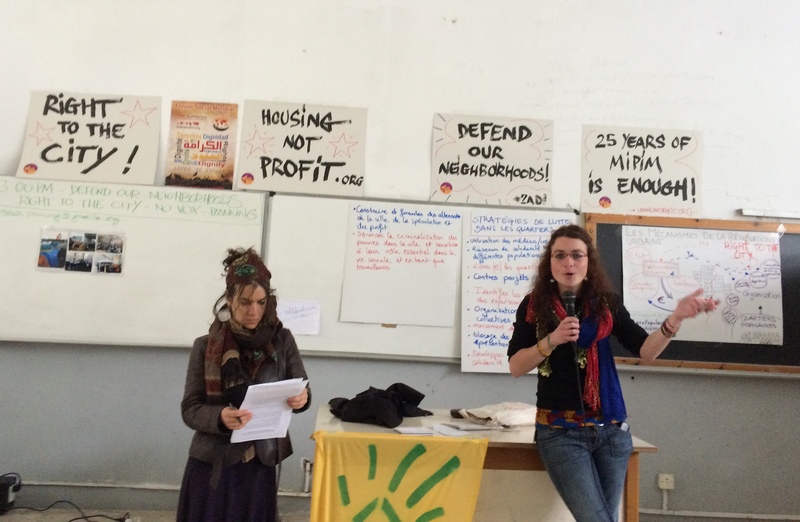 It was fascinating to hear stories from Morocco to Belgium to Taiwan to Cameroon, about building movements for land and housing rights, fighting evictions, and understanding rural-urban linkages. 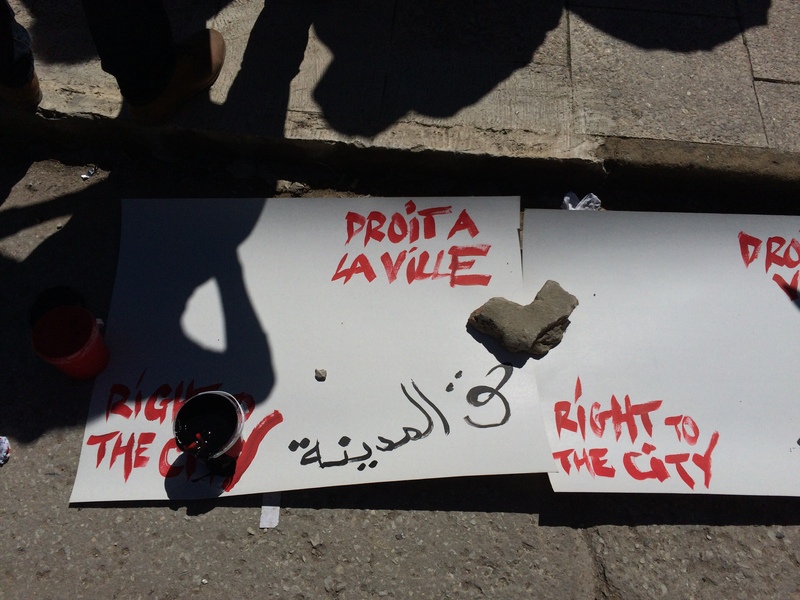 It is clear that concepts like the “Right to the City”—re-worked and re-defined in many ways since Henri Lefebvre originally wrote a book on the subject—and the “social function of land and property”, are gaining ground and that movements in various places are finding meaning in these principles. Member of Enda in Senegal discussing the social function of land. He said that the “individualized system of property” was no solution for Africa, that control of land must be collective. Habitat III certainly seemed to inspire some frustration. The space for civil society to engage in Habitat III actually seems to have narrowed since the first Habitat conference took place in Vancouver in 1976. At the Forum in Tunis, some groups seemed eager to find a way to engage in Habitat III, not to be left out of the process, while others seemed suspicious—hardly surprising for such a vast UN apparatus like this one that so far, has mildly encouraged civil society participation but has not taken active steps to ensure civil society groups are included. One person asserted it was necessary to play “hardball”: if the Habitat III doors are not open to civil society, then civil society should not go to Quito at all. Another person suggested that if that were the case, there would still be NGOs and other organizations who would participate, and that these groups would be used by the UN to legitimate its procedures. Others said that in the case that civil society were not welcome in Habitat III, then at the very least alternative activities should be organized in Quito, and steps should be taken to anticipate the repercussions that such a mega-event could have for residents of Quito itself. The only thing that seemed clear was that there was no consensus on how it might be possible to for civil society to have a unified approach as to engaging (or not engaging) with Habitat III. In addition, there is the question of who actually constitutes “civil society”. 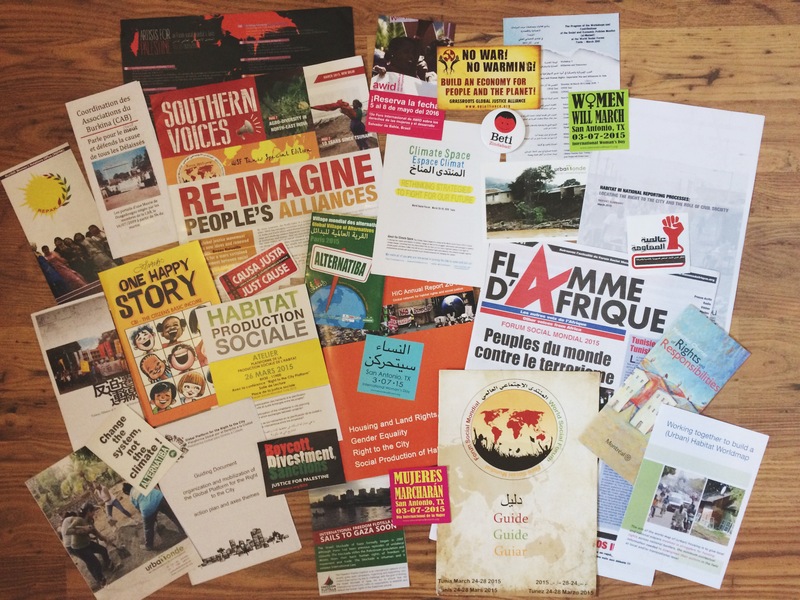 Throughout the week I heard a few comments about how the World Social Forum in general is becoming increasingly “professionalized”, with many professionals, academics, NGO employees, etc., forming part of recent transnational networks and organizations. This is not necessarily a bad thing—in the fight for alternatives to neoliberal globalization, the more the merrier, right?—but it does mean a lot of the debate risks becoming inaccessible to to all but the university-educated. It means the conversation might be diverted away from the grassroots activists and social movements who formed the basis for the first World Social Forum in Porto Alegre. Within debates about Habitat III, one woman stated that the discussions on the “Right to the City” were getting technocratic. That comment has stayed with me. As I find myself somewhere between the worlds of activism and academia (not that these are two disparate, opposing worlds), the question of how to discuss and expand these ideas while keeping them relevant to real movements and struggles is a crucial one. 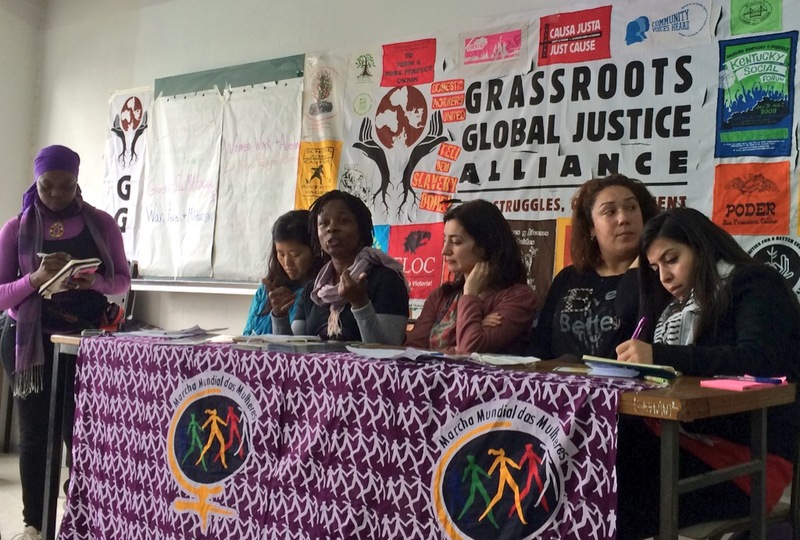 While it was so difficult to decide what final WSF activity to attend, on the last day I went to a “Feminists Unite” event again organized by Global Grassroots Justice and the World March of Women. The energy in the crowded room was immediately apparent, the kind of energy you would hope for at a World Social Forum. A panel of women from Palestine, Tunisia, Kurdistan, Mozambique, and the U.S. shared experiences of women’s struggles in their respective countries. The woman from Erbil explained Kurdish women’s concept of “self-defense”, and how, while Kurdish women fighters are breaking the stereotype that women in war are merely victims, they are also not glorifying their use of weapons. Rather, they are forced to use weapons to defend themselves within a global militaristic patriarchal system. The woman from Mozambique talked about how large development investments from countries like Brazil and China are affecting women’s rights to land in Mozambique—effectively connecting gender and land rights struggles in a powerful way. Since everyone kept to their allotted speaking time, there was then time to divide up into groups to discuss particular issues, from war and militarization to climate change. I think the best part of this was in reporting these discussions back to the larger group: one young Tunisian woman, who had volunteered as a translator at the event, ended up being the one to summarize the key points from her group (in English, presumably her third language), passionately explaining the struggles of women in work, using international examples as well as from her own Tunisia. In the end i think it is the imperfect and sometimes haphazard translation that took place in each event that is the perfect metaphor for the World Social Forum itself. Translating concepts across cultures and finding commonalities between struggles while maintaining an awareness of very different political and historical contexts is not an easy process. It is always imperfect. The sheer diversity of experiences and histories and languages in such a space is in moments overwhelming. But it is the possibility of translation, of identifying common struggles, of asking and learning how to be an ally to others, that is the lasting value of events like the World Social Forum. Great Job Rafaella! I can totally relate to your duality (?) 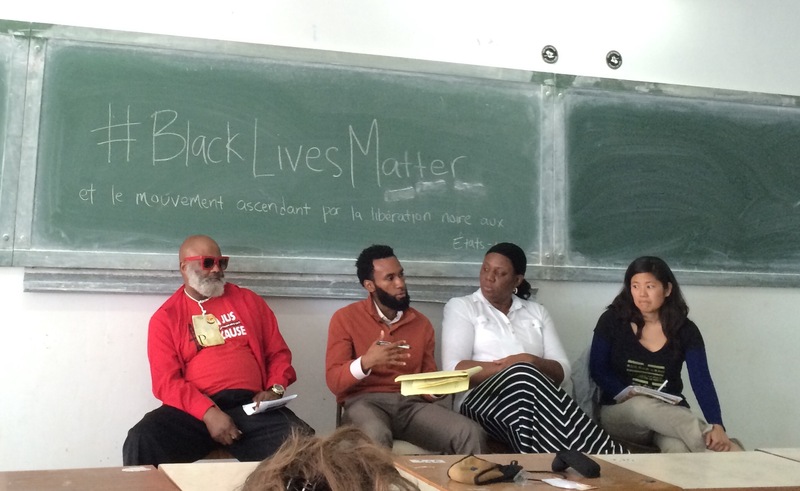 of being an activist and an academic (in my case wanting to be). I enjoyed your post very much! Thanks for sharing. Thanks for your comment and for reading, Maria! I am sure you can appreciate these dilemmas. Look forward to discussing further in the near future 🙂 Big hugs! thanks so much for sharing Raf! big hugs.